The Friend Box Company was founded in 1884 by members of the Friend family, and did business at a factory in Danvers, Massachusetts (about 20 miles north of Boston, in Essex County), making rigid cardboard boxes such as jewelry boxes, cigar boxes, etc. Lester Danforth Friend (also known as "L.D. Friend" and even just "L.D.F.") was born in 1895, and probably entered "the family business" as a teenager or as a young man. He served in World War I, and met Walt Disney sometime during the War. They were lifelong friends from that point on. By the 1930s, it appears as if Friend Box Company was wholly-controlled by Lester Friend. Every story I've ever heard, from those who knew him, says that Lester Friend "owned" the box factory (but whether he was its President, or a major stockholder, or its "owner", is no longer known by any living members of the live steam hobby, as those who knew, are all deceased). Regardless of what position he held, Lester was "the boss" at the box company. (The Friend Box Company is still in business today, but is no longer owned by the Friend Family. 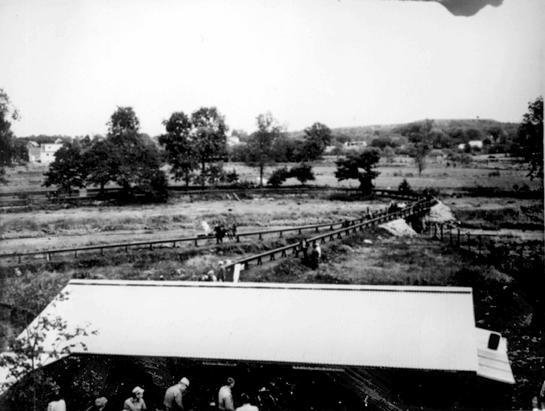 In 1938, Lester built the New England Live Steamers track on the property behind his box factory. It was a 2-1/2" and 3-1/2" gauge elevated ("highline") loop of track some 600' in length that went out to the bank of the Porter River, a tidal marsh, and then returned. On its return, it crossed a "high trestle" over part of the tidal marsh. This "High trestle" was about 8 feet off the ground. Charlie Purinton (1922- ), the son of Brotherhood of Live Steamers founder Charles A. "Carl" Purinton (1898-1999), has told me that he and some local live steamers of the era (and several of Lester Friend's employees of the box company) helped to build the NELS Danvers track, and that it was built in less than a month! Charlie was 16 years old at the time. The original (1938) New England Live Steamers' Loop behind the Friend Box Company, Danvers, MA. Today, an addition on the box factory occupies this very spot, and the lawn in the left of the photo is the parking lot for the factory. 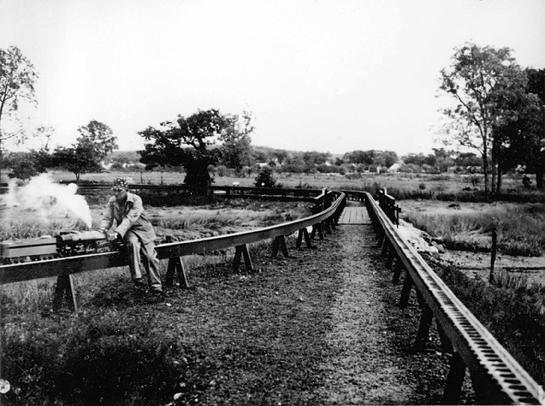 Jim Turnbull about to cross the "High Trestle" at the New England Live Steamers track at Danvers, MA in 1938. In September 1938, The New England Live Steamers (NELS) track was host to that year's Brotherhood of Live Steamers (B.L.S.) Annual meet. Over the years the NELS track at Danvers held several B.L.S. meets. After its 1938 beginnings, the heyday (or "golden era") of activity at the NELS track was during the 1940s and early 50s. Each year, several running meets would be held during the spring, summer, and fall; the New England Live Steamers "Annual Meet" (which was also quite often the Brotherhood of Live Steamers Annual Meet) would be held for 3 days each September. 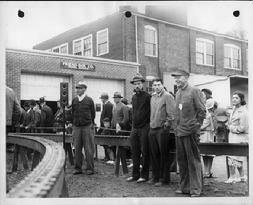 Visitors behind Friend Box Company in Danvers, Mass., at the Brotherhood of Live Steamers meeting in 1938. The same view in 2008. 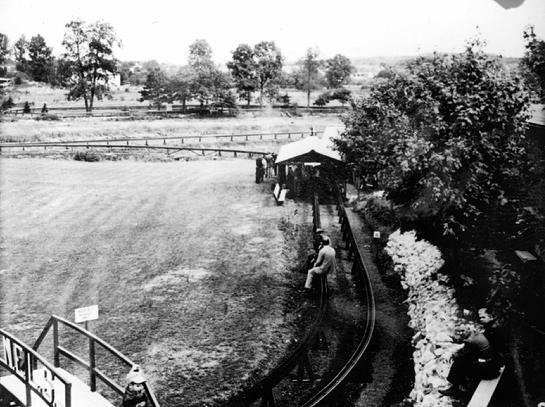 It has been SEVENTY YEARS since the photo at left was taken, and about fifty years since live steam trains have run here. Lester Friend was also a machinist by trade or by hobby (or was just good at it), and Yankee Shop Machinists was the name of a machine shop owned by him in a little building adjacent to his box factory. 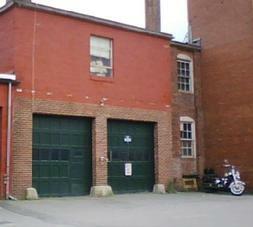 The address was at 88 High Street, Danvers, Massachusetts. It opened in 1939, and at first probably did small contract-machining jobs. 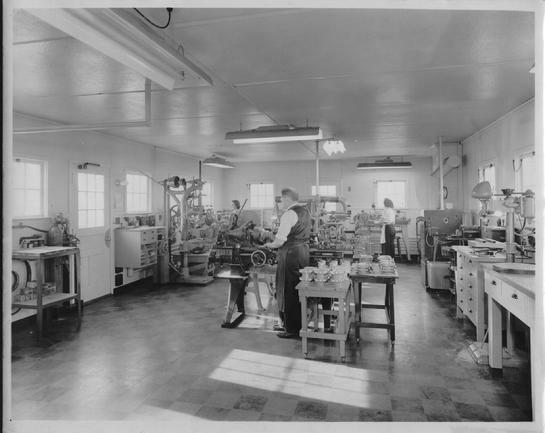 By the 1941 War, Yankee Shop Machinists was making machined parts for the war effort. But beginning in about 1939-1940, one of Lester Friend's "sidelines" in the machine shop was the sale of castings for his own line of 3/4" scale live steamers. He called his castings business "Yankee Shop". At first the product line included a 3/4" scale Boston and Maine 4-4-2 Atlantic, and a 4-6-6 "suburban tanker" modeled after the commuter engines then in use on the Boston and Albany Railroad. Inside YANKEE SHOP, circa WWII. That's Lester Friend in the foreground. Note the 2 ladies in the background working at the machines, probably doing their part for the War effort; and note the waxed, red-and-white tiled floor! Both photos, courtesy of Albert Grant. The original Yankee Shop building at 88 High Street is still there to this very day, next to Friend Box Company, but now houses Merchants Liquor Mart. Out back, if one knows where to look, there are still traces of the old live steam track along the banks of the Porter River. 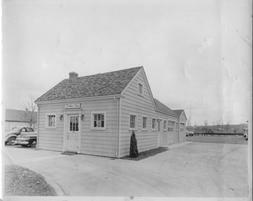 YANKEE SHOP, 88 High Street, Danvers, MA, circa 1940s. This was Lester Friend's machine shop from which he began selling live steam castings about 1939. Note partial view of New England Live Steamers (NELS) track in the background. The former "Yankee Shop" as seen in August, 2008. 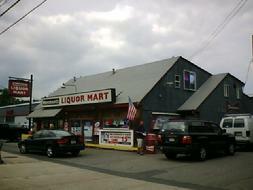 The building is now home to MERCHANTS LIQUORS, and has had several additions and renovations over the years. 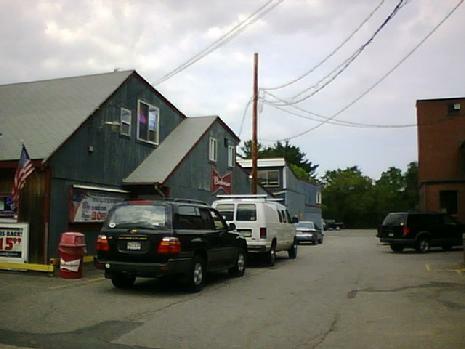 The driveway next to Merchants Liquors, the former "Yankee Shop". In the 1940s era photo of Yankee Shop (above left), the NELS track can be seen at the end of this driveway. This is what the scene looks like in August, 2008. A portion of Friend Box Company can be seen at the right. 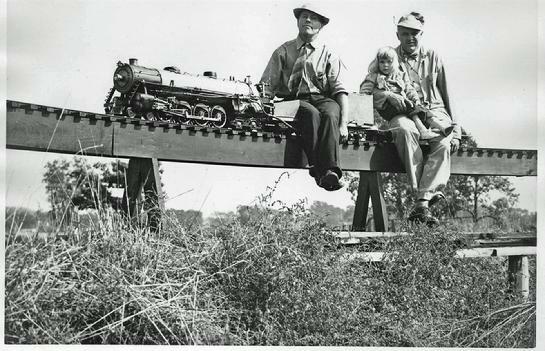 In the early 1940s, the 3/4" scale live steam castings business was booming, and Lester Friend "bought out" the famous 3/4" scale New York Central Hudson design of Laverne Langworthy of Westerly, Rhode Island. And during WWII, Lester added a 3/4" scale Boston and Maine 4-6-2 Pacific, and a 3/4" scale 4-6-6-4 Union Pacific "Challenger" to the product line. Then, in the late 1940s, when 1" scale was becoming popular, Lester added a "dual gauge" outer loop to the New England Live Steamers track. It had 3-1/2" and 4-3/4" gauges, and the previosly-popular 2-1/2" gauge size was not included on the new loop. About 1950, this outer loop was substantially extended across the Porter River to Lester's property on the other side of the river. The track went over a bridge, turned left and made a loop, and then it came back across the river over the same bridge. Also in the early 1950s, Lester added a 1" scale 4-4-2 and 4-6-2 to the "Yankee Shop" product line, and built a several-thousand-feet-long 7-1/4" gauge railroad around his private estate in Beverly, Massachusetts. The 1950s extension. 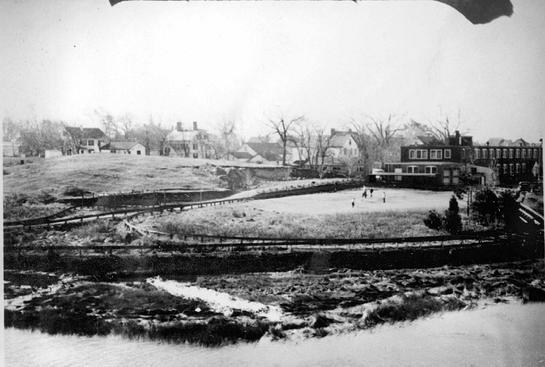 This was taken from approximately the same vantage point as the photo (above) of the original 1938 loop. The tracks cross the Porter River (just beyond the passenger station in this photo, out of sight) and make a complete circle on the opposite bank of the river (clearly seen here), then return over the same bridge. Although the engineer is not identified, the passengers are Lester Danforth Friend (1895-1962) and his daughter Lana Danforth Friend (1944-2001), on the New England Live Steamers track at Danvers MA in 1949. (Photo courtesy of Jane Friend Paddock, Friend Genealogy, used with permission). Here is a photo of the bridge across the Porter River, taken from the roof of the box factory. The loop of track on the opposite bank of the river can be seen as well. The roof in the foreground covers the steaming bays, and this is the SAME roof that today covers the "highline" steaming bays at the Pioneer Valley Live Steamers in Southwick, MA. 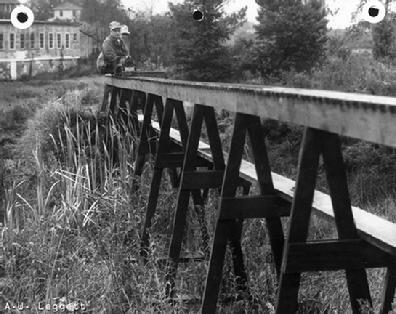 The Porter River Bridge of the New England Live Steamers track, Danvers, Ma, circa early 1950s. The locomotive appears to be a Langworthy HUDSON running "tender first", and it has just traveled around the loop on the opposite bank of the river and come back across the bridge (toward the camera). Today, the spot where the photographer stood to take this photo is covered in "puckerbrush" and thorns that are taller than most men. Thr bridge is gone; only its supporting "bents" that were "pile driven" into the muddy riverbed, remain. In the mid-1950s, Lester had a mild heart attack while on a visit to Walt Disney in California. A member of the Friend family has told me that it was Mr. Disney who personally tended to Lester's needs, and oversaw his recovery. Sometime during the 1950s, the YANKEE SHOP live steam castings business was transferred to Lester's son Joseph (Joe), who moved it from Danvers to Topsfield MA. Joe Friend renamed the castings business Friends Steam Models, and operated it until 1972. Lester Friend died in 1962 at the age of 67 and he is buried along with his wife Juliette (b. 1909, d. 1989) and son Walter (b. 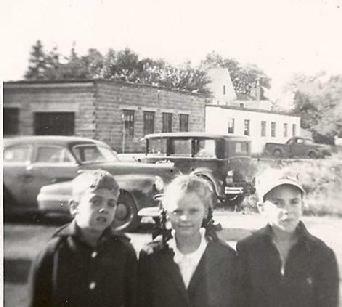 1941, d. 1988) in North Beverly, Massachusetts. Joe Friend died in 1989. 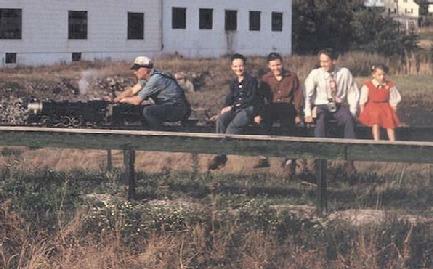 Richard Symmes, Caroline Brown, and Walter Friend at the New England Live Steamers track about 1949. Walter, Lester Friend's son, was born in 1941. He was named "Walter" after Walt Disney. (Les Friend and Walt Disney met about World War I and became lifelong friends). Photo courtesy of Richard Symmes. The New England Live Steamers track no longer exists. Old timers have told me that by the late 1950s, maintenance on such a long live steam track was becoming a problem, due probably in part to the fact that Lester Friend was "getting older" as well as developing other hobby interests (antique cars, for one; and a "park railroad" he operated at the Topsfield Fair in Topsfield MA, were competing for his attention). And also, the track suffered a fate that happened to so many live steam tracks over the years, including (perhaps) some today: everyone wanted to "run trains" but few people wanted to "repair the tracks". 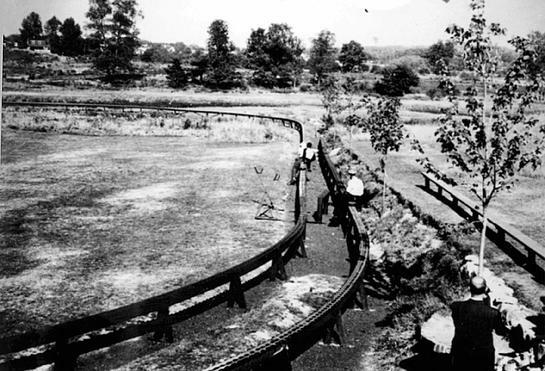 As such, the New England Live Steamers track was becoming a maintenance nightmare that was being used less and less, and was dismantled sometime in the late 1950s. 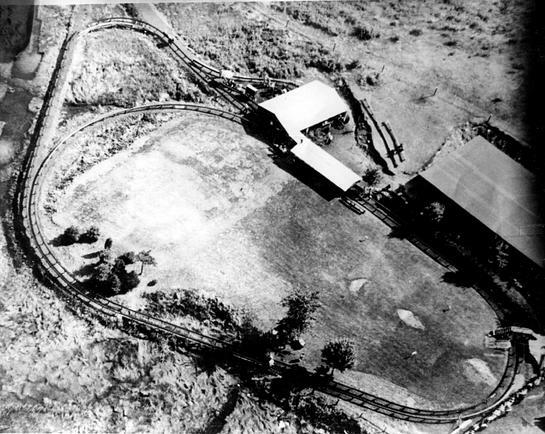 Here is a 1940s-era aerial photograph of the NELS track at Danvers. The original inner loop can be seen, as can the outer loop which has by this point completed into a complete circle around the original loop. The engine house/steaming bays are under the larger of the 2 roofs seen in the middle; the longer & narrower roof covers the passenger station. There is seating for spectators on the hillside. In the upper left of the photo, you can see the "fill" that has been placed there, indicating the right of way for the planned extension across the Porter River which was going to be built in 1950. This view was taken from the opposite bank of the Porter River, and clearly shows the inner and outer loops of track, and the box factory itself. Today, the tracks are gone; the grassy field is a parking lot. Trees, brush, and swamp grass hide most traces of the roaded. It takes a few minutes of bush-whacking for the visitor to this site to be able to locate ANY trace of the live steam railroad today. Color shots of the Danvers track are rare, but there are a few. This one is courtesy on Don Thomas. It shows what looks to be a 3/4" scale 2-8-2 on the outer loop, passing by the Union Chemical Building, and about to cross the "high trestle" (a wooden trestle about 8 to 10 feet off the ground). North Beverly, Massachusetts: The grave of Lester D. Friend (1895-1962); his wife Juliette (1909-1989); and their son Walter (1941-1988).